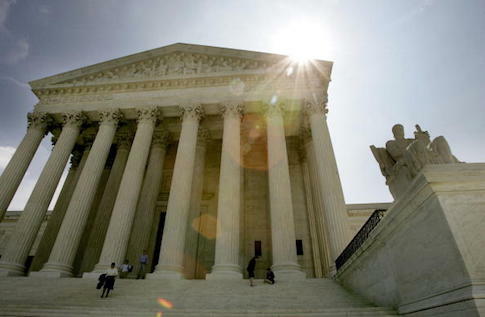 Inventors' rights can be revoked through a controversial administrative process, the Supreme Court ruled by a seven-to-two margin on Tuesday, a move that promises to continue the trend of invalidation of hundreds of existing patents. The case, Oil States v. Greene's Energy, concerns an administrative tribunal called the Patent Trial and Appeal Board (PTAB). As the Free Beacon has previously reported, the PTAB is responsible for reviewing patents whose validity have been challenged. The PTAB runs on a host of procedures alien to federal court proceedings: lower evidentiary standards, the ability of anyone to challenge a patent right, and a broad interpretative standard for PTAB administrative judges. Because of these procedures, the PTAB has a track record of striking down more or less every patent that passes in front of it: A former federal judge once called PTAB tribunals "patent death squads." Oil States argued in its brief, and in oral arguments last November, that in practice the PTAB was actively depriving American inventors of their property rights, an institution normally held sacrosanct under the Constitution. Furthermore, they argued, those property rights were being deprived by administrative courts. These are importantly not under the federal court system, to which the Constitution explicitly reserves the "judicial power." In other words: Americans losing their property rights without due process in a real court of law. But the Supreme Court's majority didn't agree with this analysis. Justice Clarence Thomas wrote for the majority, joined by his conservative colleague Samuel Alito, swing-vote Anthony Kennedy, and the Court's four liberal justices. The Court's majority opinion centered around the distinction between "private" and "public" rights. Patent rights are public rights, the Court argued, in that they are extended as a government franchise, and so are subject in their form to the terms laid out by the legislature. In the case of patent rights, if Congress stipulates that a patent can be retroactively reviewed and struck down, even under the zealous rules of the PTAB, then that is a necessary feature of the extension of the patent right to its holder. Patent rights are not a private or natural right, Thomas wrote, and the right they confer—the exclusion of others from making or selling the invention—are not common law rights. "Rather, it is a ‘creature of statute law,'" he wrote, referring to standing precedent. Importantly, the majority "emphasize[s] the narrowness of our holding," stipulating the ruling only covers the constitutionality of a certain form of PTAB review, rather than more expansive questions of patent law. This matters in part because, had Oil States been decided in the opposite direction, it would have struck a substantive blow to administrative tribunals—it is likely that at least the conservative members of the majority would like to revisit the thorny issue of administrative law. Justice Stephen Breyer seems to signal this future conflict in a concurring single-paragraph opinion. "The Court's opinion should not be read to say that matters involving private rights may never be adjudicated other than by Article III courts, say, sometimes by agencies. Our precedent is to the contrary," Breyer, joined by Justices Ginsburg and Sotomayor, wrote. Still, the narrowness of the ruling is cold comfort to American inventors who have lost their patents at the PTAB. Josh Malone, the inventor of a water-balloon filling system, claims to have spent $2 million litigating in front of the PTAB. Speaking on behalf of other U.S. inventors, Malone decried the ruling to the Free Beacon. "Inventors, aspiring inventors, and patriots of all kinds are devastated by today's Supreme Court ruling," Malone said. "Following its radical disregard for private property rights in Kelo v. City of New London, today the Court obliterated the Fifth and Seventh Amendments to the Constitution. Now if a big corporation wants your patents or your land, they only need to convince their friends in the administrative tribunal or city council to do the job. No judge, no jury, no America." Malone's distress was mirrored in Justice Neil Gorsuch's dissent, joined by Chief Justice John Roberts. Gorsuch decried the administrative law process, which he argued led to judges only accountable to their appointing patrons, precisely the situation the Founders sought to avoid with the separation of powers. "No doubt [the PTAB] is well intended," Gorsuch wrote. "But can there be any doubt that it also represents a retreat from the promise of judicial independence? Or that when an independent Judiciary gives ground to bureaucrats in the adjudication of cases, the losers will often prove the unpopular and vulnerable? Powerful interests are capable of amassing armies of lobbyists and lawyers to influence (and even capture) politically accountable bureaucracies. But what about everyone else?" Adam Mossoff, a law professor at George Mason University whose writings were frequently cited in Gorsuch's dissent, told the Free Beacon that the majority's opinion departed from a substantive history of viewing patents as private property. "For the first time, the Supreme Court holds that patents for new inventions are regulatory grants similar to monopoly grants for bridges or toll roads. The decision ignores the Supreme Court's own substantial case law over the past two centuries that patents are private property rights that secure the fruits of productive labors under the Constitution—like all other property rights in homes, farms, and animals," Mossoff said. "As the dissenting Justices point out, this turns the Constitution and the U.S. patent system on their heads. It perverts the function of the constitutional protections afforded to the property rights of all U.S. citizens, an increasingly commonplace occurrence today under the expanding and all-encompassing administrative state," Mossoff added.